Once you've installed your very own Japanese keyboard, it's time start typing. Mash those keys and you're greeted with romaji quickly morphing into kana quickly morphing into kanji. Plus there's a dropdown box. And if you hit the spacebar, things start getting really crazy. Hit the brakes. Just because you know how to enable IME, doesn't mean you know how to type in Japanese. It's pretty easy once you've figured it out, but can be tricky if you've never done it before. If you learned Japanese in a classroom, you probably did a lot of handwriting practice. If you're lucky, you didn't use much romaji, and jumped straight into hiragana and katakana. That's great! But being familiar with the two most common romaji, or romanization systems of Japanese, makes typing much easier. It can also help you find simple typing shortcuts, especially if you're using a romaji keyboard to type in Japanese. Keep that in mind while you read! Now You Know How to Type in Japanese! Before you start, turn on your Japanese keyboard. If you don't have a Japanese keyboard or don't know how to get one on your device, follow our step-by-step IME installation instructions before proceeding. Below are tables. These tables display Japanese keyboard characters and the inputs you type to make them appear. For example, to produce あ you type a. In the table below, notice the letter a is below あ. The roman letter or combination of letters you need to type to display a given character are displayed below that character. Again, this is where romaji will be helpful. If you know how a Japanese word is spelled in romaji, you can type it on your Japanese keyboard. Also, notice when you type the particle は in a sentence, you type ha even though it's pronounced wa. To switch from hiragana to katakana, usually all you have to do is hit the spacebar after you've typed the word in hiragana. If you spelled the word correctly, your IME will almost always recommend the word in katakana. If it doesn't, you may need to double check how it's officially spelled with an online dictionary like Jisho. Those are the basics, but there are a lot of other characters and symbols you should know how to type. Let's take a look at a few! You'll see a lot of half sized characters in casual Japanese. If you follow Japanese users on Twitter, Facebook, LINE, or other SNS sites, you've probably seen these chibi kana mixed in. But sometimes they're in weird spots, like this: あれぇ ねぇ ちっちぇ. To get the small tsu, you don't have to type ltu or xtsu or any of those other combinations. Think about what っ means in Japanese. It's there to mark a geminate consonant. And you spell that in romaji with two of that consonant in a row. So type the Japanese word in romaji using a double consonant. Your Japanese keyboard will know what to do and generate a っ in the proper place. Now that you know how to type in hiragana and katakana, you can start converting some of it to nice, fancy kanji. How? By using the spacebar, just like you did with katakana words. Once you have that typed out, hit the spacebar. It will give you a dropdown box with conversion options. Scroll through and choose the one you want. If what you're typing is simple enough, it might just suggest exactly what you're looking for. If that's the case, hit enter (also known at the return key) and you can go on typing. If only part of the sentence is what you're trying to type, you can fix it without having to retype the sentence one word at a time. Use the arrow keys to select the part of the sentence you want to change. Hit spacebar again until you get find the option you're looking for. 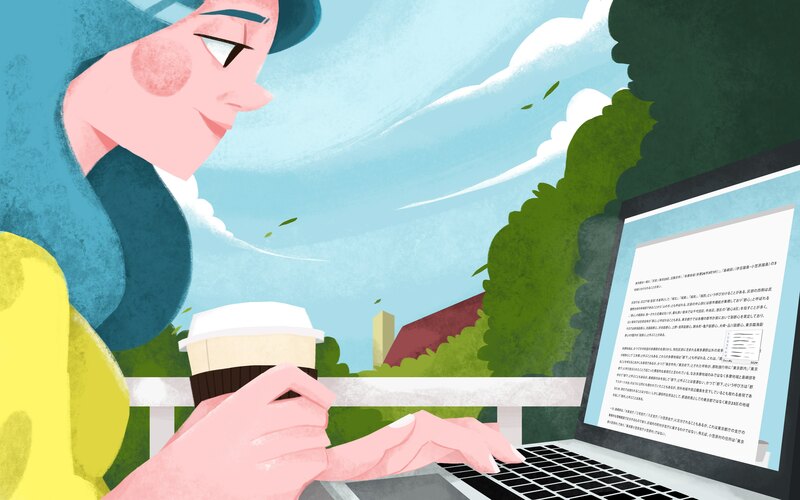 This process takes some getting used to, but with practice, you'll be hitting space and enter to toggle through your options and type Japanese kanji without even thinking about it. Aside from punctuation, there are some symbols in Japanese that you might need to type too. Some symbols may take typing the right word to find. You'll need to look through your options to find these, but the Google IME has them all nicely hidden within your keyboard! These extra bits of punctuation work with Google IME, but not MacOS IME. Want some variation? No problem! Type the Japanese words below and hit enter to get a slew of symbol options. There are more Japanese symbols you can make with your keyboard. Check out some mini (and kinda outdated) lists of symbols here, if you need more. If you're studying Kobun, also known as Classical Japanese, you'll need to know how to type old, defunct characters. There aren't too many of them, but not having to copy/paste them all the time is a huge time saver. You'll probably still have to be careful when typing in kobun though. Your Japanese IME is going to try to correct everything you're doing. So knowing your keyboard shortcuts is going to help you out. Oh, and you'll need to use your new space-toggling knowledge to get to them. Because the IME is thinking, "What? This old stuff? Nah, you don't want that, have うぃ instead." ゟ should appear in your IME but ヿ may not, unless you're using Windows IME. This is probably the only one you'll have to find online and copy/paste. But unless you're transcribing really ancient katakana for コト smooshed together to make ヿ, you'll probably never need to. You did it! You made it to the end. You know how to type in Japanese! And boy, do I have a surprise for you. Your Japanese keyboard offers kaomoji right at your fingertips. Don't have a typing shortcut program or app? Tired of searching for hours and hours for the right kaomoji to send to your mom, boyfriend, or dog? Well, look no further than the computer you're using right now! But if you want those, go read the guide he spent a month of his life writing. To get your plain (and not very special) kaomoji, type the word かおもじ and scroll through the list to find a bunch. Sometimes you can get lucky and the word you're typing will have a kaomoji in the list of options too. There are tons more, so go through some emotional words and see what you can find. You can also find emoji this way too (by typing emoji or just kao for the face ones). But emoji are less cool than kaomoji, so I can't see why you'd wanna go and do a thing like that. Psh. That's all I have left to teach you, young padawan. I hope this helps you on your Japanese typing journey. If you didn't find what you were looking for, shoot us a tweet and we'll try to help you out!